﻿ Jurgen Klinsmann: "No one wants to face an angry Ronaldo!" 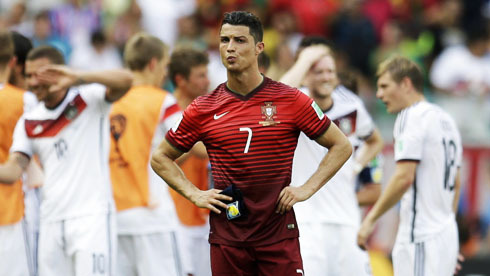 18.06.2014 » Jurgen Klinsmann: "No one wants to face an angry Ronaldo!" When a team loses such an important game and in such an emphatic way as Portugal did just a couple days ago against Germany (4-0), usually the best medicine is to simply get onto the pitch as quick as possible and face their next opponent. With a decisive USA vs Portugal scheduled for next Sunday night, Paulo Bento's men will have a good chance to redeem themselves from the extremely poor performance in their debut match against the Germans. 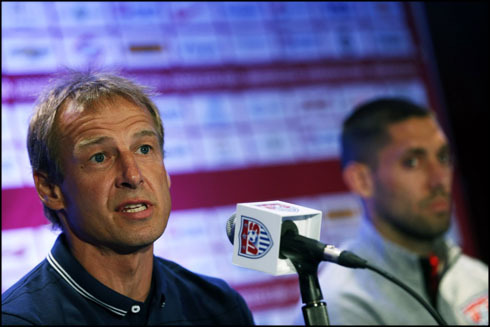 However and in order to do so, they'll have to get past the USA National Team, a very well organized and spirited team, currently under the orders of a German legend, Jurgen Klinsmann. In the meanwhile, the 2014 FIFA World Cup doesn't stop and among the many games we'll be getting the opportunity to watch live throughout the next few days, the spotlight will be turned to the Uruguay vs England clash at the Maracanã, in Rio de Janeiro. Both teams are coming off an opening loss and whoever leaves the pitch defeated in this match won't be making it to the next stage. Roughly 12 years ago, the USA and Portugal faced each other in the early rounds of the 2002 FIFA World Cup that was held in South Korea and the outcome of that game was quite surprising at the time. The Americans inflicted a 3-2 loss to the Portuguese in the opening match of Group D, with all their 3 goals being scored in the first 36 minutes of the game. That game naturally ended up putting Portugal under an enormous amount of pressure and with another loss this time against the hosts in the third and final game of that group, Portugal waved goodbye to their World Cup participation, while the USA and South Korea advanced to the next round of that year's major football tournament. At that time, Cristiano Ronaldo was still 17 years old and hadn't been called to the Portuguese Team yet (he only made his international debut in August of 2003). Nevertheless, that was the Portuguese "Golden Generation" that the USA beat that day, filled with plenty of talent coming from players like Luís Figo, Rui Costa, João Pinto or Pauleta, all of those quite close to their prime. It's 2014 now and Portugal's face has changed completely. As much as we would like to deny it, the truth is that the "Selecção" is heavily depending on Cristiano Ronaldo for a few years now and it's probably not going to be much different next Sunday, when they take center stage in Manaus in order to lock horns with the USA. The fact that they have lost in such an humiliating manner against Germany in the opening round, combined with the memories of that 2002 elimination at the hands of this very same USA team, will understandably spice up this Sunday's game with even more pressure. Great match in prospect! When previewing this upcoming USA vs Portugal clash, the North-Americans coach preferred to down play expectations for the game and simply made note of the danger coming from a team and a player like Cristiano Ronaldo, who have all had their pride hurt. Jurgen Klinsmann: "I'm sure that the Portuguese players that we'll face in Manaus will be very angry. We definitely would have preferred not to face Cristiano Ronaldo in these circumstances... We'll have to show Portugal and the World how good we are if we really want to pull out something positive from this game", started by remarking the USA coach who has been in the crosshairs of the media over the last weeks after stating that his team didn't have any realistic chances of winning the FIFA World Cup in Brazil. Klinsmann: "I hope the injury that Jozy Altidore picked up in the game against Ghana isn't as serious as it looked like the first time, because the truth is that he's very important to this team. As for Clint Dempsey, he'll need to have his nose taken cared of since it's confirmed that it got broken. I had similar injuries in the past and I know how much it can hurt, but he'll probably make it to the game against Portugal", commented the former German international, when asked to clarify about the physical status of two of this USA team's most important players. With Altidore and Matt Besler both struggling with hamstring injuries and Dempsey facing problems with a broken nose, 4 days away from the matchday against Portugal probably only Altidore is certain to miss the game. As for the Portuguese Team, Fábio Coentrão will be forced to miss the rest of the World Cup after his muschle injury in the game against Germany, while Rui Patrício and Hugo Almeida will also be unavailable for this Sunday's match against the USA, but might still return for the final fixture of the group against Ghana. As if those weren't enough worries and setbacks for Paulo Bento, Pepe is also suspended for the game against the USA, after having been sent off last Monday. 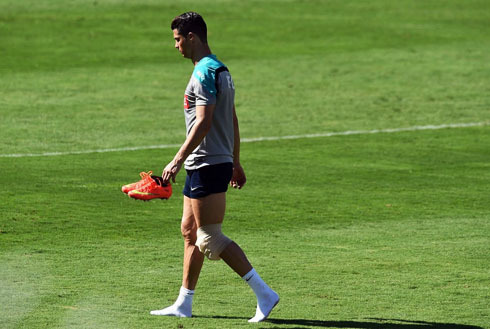 Cristiano Ronaldo has been training with limitations due to his well known problems in his left knee and this Wednesday he even left the team's practice before it was over. Nevertheless, the Real Madrid star is expected to be fit for the match against the USA, taking place in Manaus next Sunday night..
Cristiano Ronaldo's next game will be his second fixture in the World Cup in a Portugal vs USA encounter, scheduled for June 22 of 2014, in Manaus (Brazil). You can watch Juventus live stream, USA vs Portugal live stream, Honduras vs Ecuador, Uruguay vs England, and Italy vs Costa Rica, all matches provided from our World Cup live stream pages.